The Terracotta Warriors and Horses in Xi’an are one of the most important archaeological finds of the 20th century and although Xi’an has many other worthy attractions, these unique treasures are the main reason for visitors coming to this city. 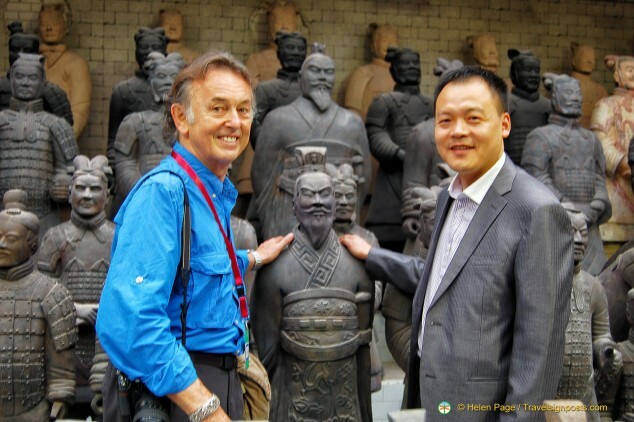 Our program in Xian is jam-packed with activities but before going to the Museum of the Terracotta Warriors and Horses, we make a morning stop at the Xi’an Art Ceramics & Lacquer Company. Here we have a quick tour of the factory to get a quick insight into the process for making terracotta warriors, which is interesting, but the real reason I suspect for stopping here is to lure us into doing some shopping. After the factory tour we find ourselves in a huge shop floor where terracotta warriors of various ranks and in different sizes are on display. It’s been estimated that the Terracotta Army consists of more than 8,000 soldiers of various military roles and each warrior has a unique face. It’s interesting trying to make out the differences in their facial expressions and the uniforms worn. There are gift sets of two or three warriors in presentation boxes and these are not too expensive. And while most in our group are looking at the little souvenirs to take home, at the other end of the hall Tony has his eyes set on the bigger things. A salesman, no taller than the medium-sized warrior, helpfully provides Tony with all the measurements of the different warriors. It’s at this stage that I realize that Tony’s not thinking of miniature warriors in presentation boxes, but the larger ones. I remind him that we certainly will not be able to fit the larger than life warriors in our apartment and so we compromise on the medium-sized ones. 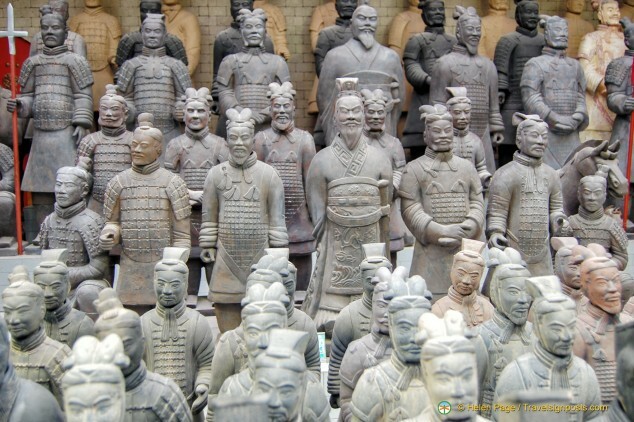 China’s first emperor Qin Shi Huang had the army of warriors made to protect him in the afterlife, but for most of us these days we buy these terracotta warriors to decorate our homes or gardens so we have to find warriors whose faces we like and enjoy looking at. The boss of the shop notices some keen interest on our part and comes over to be involved. It’s just as well as he’s the guy who can give the final okay on prices and we negotiate with him a price for the Emperor and Kneeling Archer that we like. Once the deal is done, our helpful salesman measures up our warriors so that we know what we will be getting in a couple of months’ time. I’m glad to say that our warriors arrived safely and within the two-month time frame indicated by the shop. They were so well sealed in foam and Tony had fun removing all the foam and packaging. The warriors are very heavy as well and we needed help from a neighbour to lift the Emperor onto his pedestal. 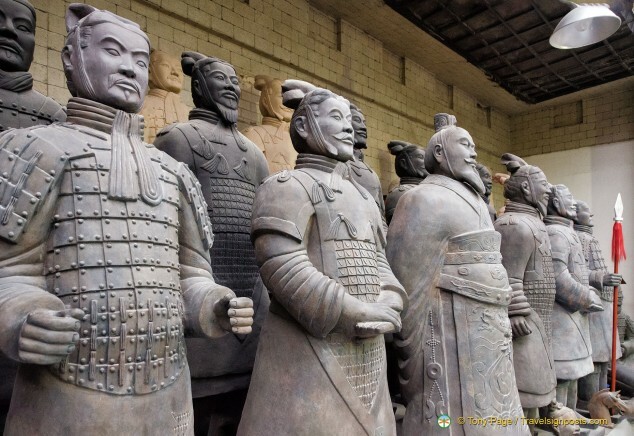 If you intend buying the larger terracotta warriors which require shipping to your home, be aware that the shop will quote you a CIF price – that is the cost of the goods, insurance and freight to your destination port. What’s not included are the cost of port charges at destination, customs clearance, fumigation (if required) and import duty, if any. These costs are payable by you separately to the clearing agent in your home country. You should get a rough idea of what this cost will be from a local freight forwarding company so as not to be surprised. I mention this because I read a Tripadvisor review where the individual who bought goods from this shop warned people not to buy from them as there were “hidden charges” that he was not aware of. Unfortunately, it’s probably the case of him not understanding what the term CIF means. Is this shop where you bought your warrior the same shop as the Xi’an Art Ceramics & Lacquer Company? How much did you pay for your warrior? 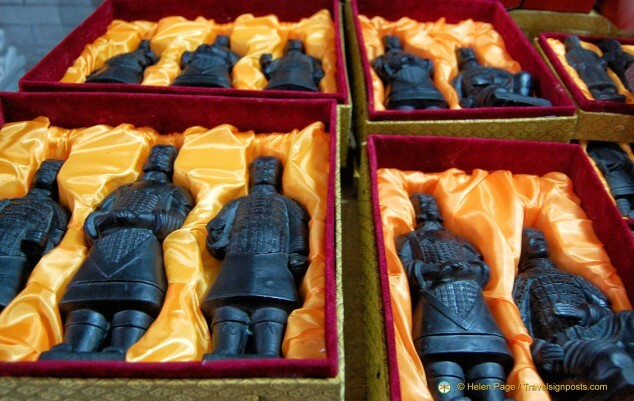 As mentioned in the post, we bought our warriors from the Xi’an Art Ceramics & Lacquer Company. We were taken on a tour of the factory and given an insight into how the terracotta warrors are made and then ended up at the shop. We wanted good quality warriors and selected two that we liked. By buying two, we were reducing the freight cost for each statue. I can’t remember how much we paid, but we didn’t think they were terribly expensive. We visited this shop on a Wendy Wu tour and so we relied on the reputation of Wendy Wu to take its customers to reputable shops. The manager was very nice to deal with and the shipment arrived very promptly. 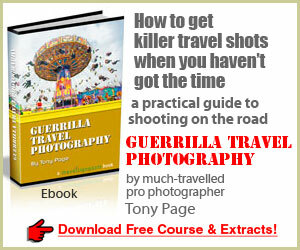 Make sure you understand what the quoted price covers, see our buying tips. Some people who probably have not understood the shipping costs have complained of undisclosed charges. We’ve had our warriors for three years now and they are still looking good. 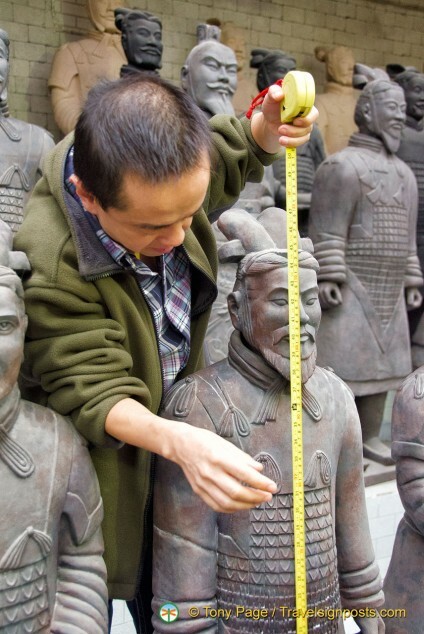 I’m looking at buying a lifesize terracotta when we visit China next week. Do You know how much cost a 1/2 size Sword General? Adele was visiting China in June so she may not see your query. I looked up a site that was offering terracotta warrior on-line sales and you may be interested in the prices as an indication. You should be able to buy yours at a cheaper price while you’re there. Hope this is helpful as a guidance. First of all I congratulate you, the information contained in your article was very interesting. Soon I will leave for China and I would like to buy a statue size 1/2. I wanted to ask you if, as in the rest of China, the prices shown are negotiable or not. You should definitely bargain for your terracotta warrior. The shipping cost is usually a substantial portion of your total purchase price so if you buy two statues, the cost can be divided between the two. You’ll find that the shops are happy to discuss different options with you. Love your article, could you advise what finish you went for on your terracotta. We bought the ones you see in the pictures, i.e. not coloured or glossed. Enjoy your terracotta warrior shopping.